TWO DUBLIN SINN Féin TDs have said they remain satisfied with the party’s policy that deputies take home the average industrial wage. Yesterday, The Irish Times reported that Sinn Féin is to review its policy of paying party members the average industrial wage – primarily for TDs living in the capital, where the cost of living is higher. 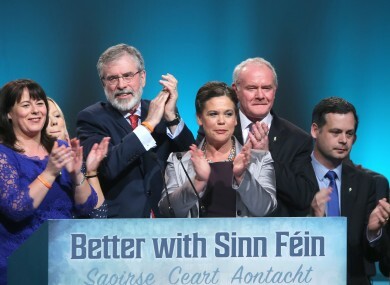 When asked about the review, a Sinn Féin spokesperson said it “is a growing party with new mandates north and south. We keep these issues under review”. “You always knew you weren’t going to get rich becoming a member of Sinn Féin, and rightly so,” said Denise Mitchell, Dublin Bay North TD. She said she had not heard that the matter was under review, but added that it has been a long time policy of Sinn Féin. Dublin South- Central TD Aengus Ó Snodaigh also said he was not aware of any review, but said deputies taking the average industrial wage is party policy. He said living in the capital is more expensive, but said he was not sure how a change in policy might work, stating there are a number of factors that might make one think they should earn more. “Some people might have a number of children, for others their spouse might also be earning a wage, or might not,” he said. Ó Snodaigh said he was satisfied with the policy as it stood. However, he said the average industrial wage does fluctuate over time, and said that should be represented and taken into account. Email “'You always knew you weren't going to get rich becoming a member of SF'”. Feedback on “'You always knew you weren't going to get rich becoming a member of SF'”.